A couple of days ago Apple announced the newest version of the Apple watch, a new device in a product category that has felt like a solution looking for a problem to solve. And at the event, it seemed like Apple has finally achieved that objective. While other Smartwatch makers have just gone about making smartphones that you can fit on your wrists, Apple and Fitbit have realised that the ideal move should be a pivot towards health. And at the Apple event, it seemed like Apple had hit the first real milestone in making the Apple watch a truly compelling product. It has finally answered the question of where the Apple watch fits in the sea of smart device. We've all read about the number of times where the Apple watch has prompted its owners to see a doctor which led to the discovery of a potential life threatening ailment. 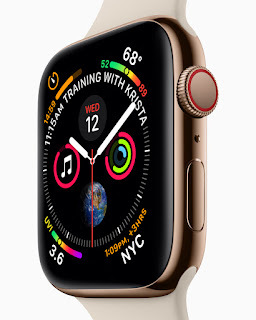 And now with the introduction of the Atrial Fibiltration and Fall detection features, the Apple watch is even more compelling and is no longer just a smartwatch but a true health device. With the holiday season on the way, it's not hard to see that the Apple Watch topping the list of gadgets sold during this period.